Save up to 75% on select sale items. Sign up for gardening tips and great deals. Where would we be without plants? Nowhere good, that’s for sure. Home gardens are good for the planet, good for your body, and good for your soul. 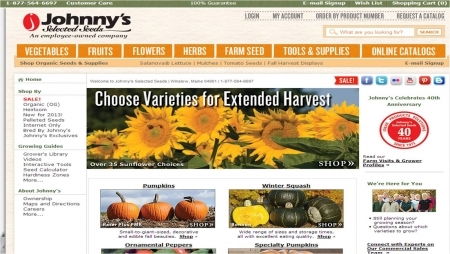 Plant a Johnny's Seeds coupon code to grow your savings when getting the seeds you need to create an edible wonderland. Are you looking for seeds, plants and gardening products similar to Johnny's Seeds? Consider checking out our Burpee coupons for more great deals on seeds and plants for your garden. The mission of Johnny's Selected Seeds is “to help families, friends, and communities to feed one another by providing superior seeds, tools, information, and service.” Good for them, better for us. If you’ve never tasted a freshly picked tomato, man are you missing out. gardening accessories that help bring out the inner farmer in us all. 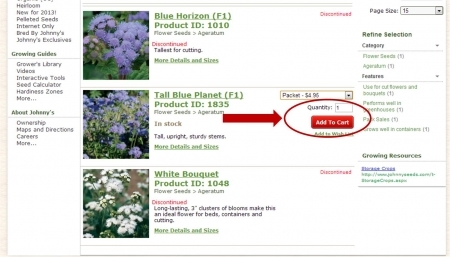 Their online catalogue offers the most variety of seeds available anywhere. From Artichoke to Zucchini, Blackberry to Strawberry, Ageratum to Zinnia, if you can grow it, chances are Johnny’s will have it. They pride themselves on their huge guaranteed organic section, as well as being a member of the “Safe Seed Initiative” which means they do not buy or sell genetically engineered seeds. The chance of a cabbage grown from one of Johnnys’s seeds coming to life and taking over your body while you sleep are absolutely zero. Very good to know. Available tools and supplies for the garden include: crop supports, fertilizers, all manner of rakes and hoes, cultivators, irrigation, seed starting supplies, and basically everything you could ever need to make your garden grow. Check out the complete list on their website. Speaking of their website, it feature tons of useful information. They have descriptions for each plant type they sell, how-to videos, germination guides, and much more. They aim to make gardening as easy and successful as possible, even indicating which plants are for “beginners,” “experts,” and so on. Another big plus about Johnny’s is that they are renown for their wonderful customer service, and are always ready and willing to lend a hand. Turn you backyard, patio, balcony, or even windowsill into fresh fruit, vegetable and flower shop. The rewards are many, the risks few. Save on your grocery bill, and save on the seeds that will make that happen by using a Johnny Seeds coupon code to get started. Whether you are looking to add color or make a fruitful backyard with produce to eat, now is the perfect time to get your seeds into the ground. Below are instructions on how to use and apply a Johnny's Seeds coupon code to save money on your purchase. After locating the Johnny Seeds coupon code you want to use, click the corresponding "Get Deal" or "Get Code" button on the Couponpal Website. A new window will pop open when you click on your button. If Couponpal is providing you with a Johnny's Seeds coupon code, copy and paste from the pop up window. Keep this window open in case you need to come back to it later. 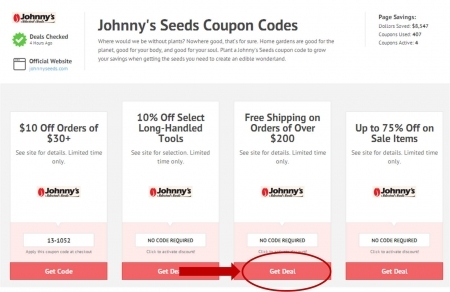 If there is no Johnny Seeds coupon code, you will skip this step. You can now browse through the category of Johnny's Seeds items you want to purchase. For example, you can click on Vegetables, Fruits, Flowers, Herbs, Farm Seed, and Tools & Supplies. Continue to refine your product search results by using the menus. 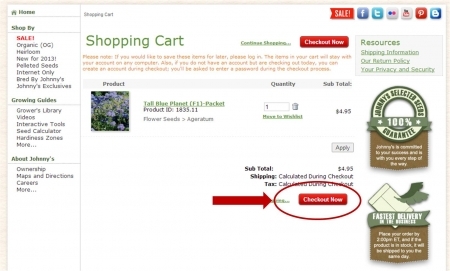 When you find a Johnny's Seeds item you are interested in, choose the volume of seeds you wish to buy, the quantity of the volume, then click "Add to Cart." Confirm everything in your shopping cart is correct, then click "Checkout Now" to finalize purchase. Enter your billing, shipping, and payment info. Then confirm your order and complete order.